The importance of a fast, stable and secure connection within the home has placed renewed focus on the once-humble router. Today's latest solutions are designed to serve as the home's central hub, with dizzying speed claims, the ability to service multiple wireless clients simultaneously, Gigabit LAN, and centralised file sharing featuring as the most common value adds. The next item on the hit list appears to be gaming optimisation, with many of the key names in the industry presenting new gear designed to minimise lag and latency in favour of smoother gameplay. Truth be told, the first gaming routers to appear on the scene were merely masquerading as a gamer's best friend, but recent additions have proven that network optimisation can enhance the in-game experience. One of the best examples to date is the WRT32X, a collaborative effort between Linksys and Killer that can detect and prioritise network traffic to ensure latency-sensitive data is given right of way. Netgear is eager to join the fray and has done so with the Nighthawk XR500 Pro. Priced at a cool £240, this ultra-high-end gaming router marries Nighthawk hardware with the intriguing DumaOS operating system from UK-based developer Netduma. A match made in gaming heaven? Let's find out. As a gaming solution, it's no surprise to find that the XR500 Pro looks a fright. There will be plenty who appreciate the edgy form factor, LED lights and aggressive styling, but the design and plasticky chassis aren't our cup of tea. It has the look and feel of a children's toy, rather than a grown-up gadget, and hiding it is easier said than done as the 322mm x 244mm x 55mm footprint is significant. This isn't an elegant addition to the home, but it ought to be a potent one. 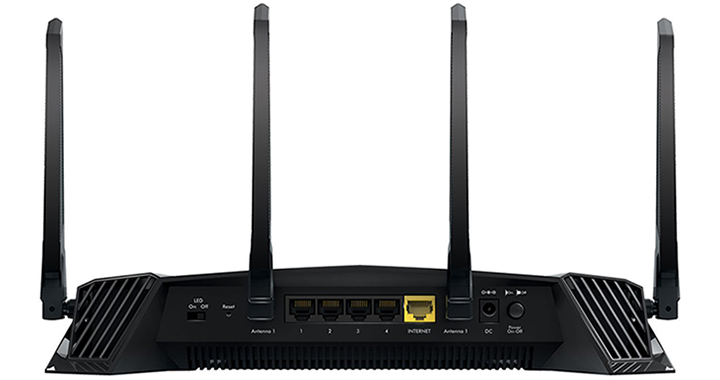 Beneath the hood, Netgear employs a dual-core 1.7GHz processor and 512MB of memory that help drive the five Gigabit Ethernet ports (four LAN plus WAN), two USB 3.0 ports and four high-performance WiFi antennas. 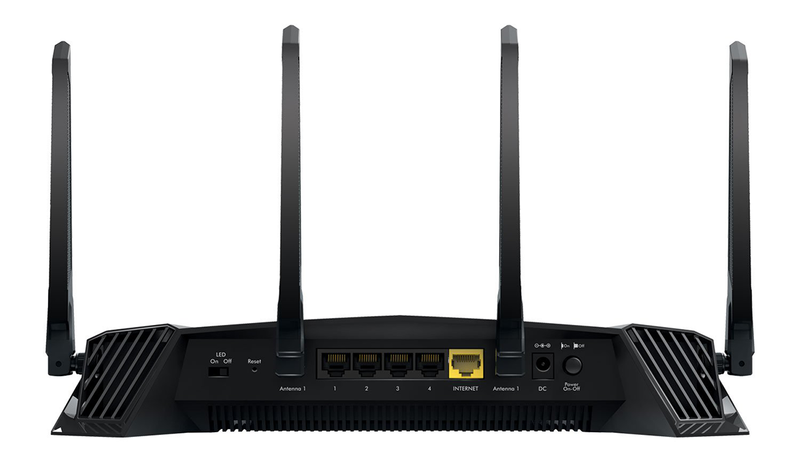 Touting dual-band speeds of up to 2.53Gbps (800Mbps at 2.4GHz plus 1,733Mbps at 5GHz), the XR500 Pro is a modern wireless AC solution with support for MU-MIMO, but the hardware itself could be deemed unremarkable at this price point. Netgear's port arrangement is logical, with everything bar the left-sided USB ports lining the back edge, and we appreciate the dedicated hardware toggle switch for the LEDs, which can otherwise be distracting in a dark room. Curiously, the LAN LEDs on our review sample appear to be labelled back to front - connecting to port one on the rear results in Eth4 illuminating on the front of the device. Elsewhere, the connector for the external power supply is paired with an on/off switch, and the WAN port is coloured yellow for easy identification. Remember, this is a router-only solution and can be used as either an access point or a fully-fledged router with your modem attached. 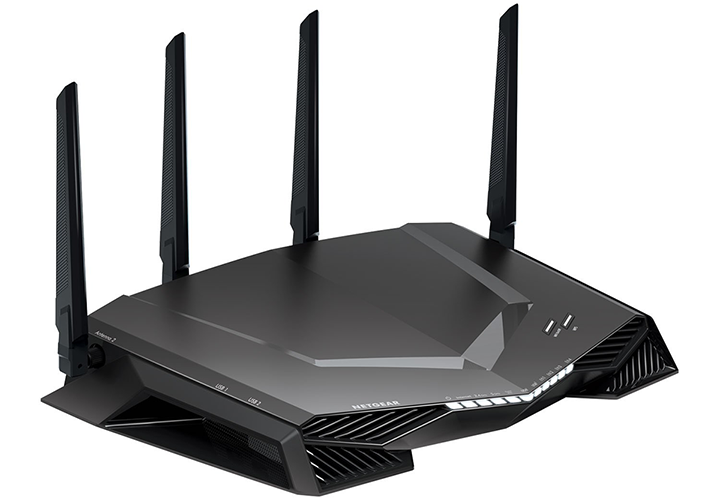 You could argue that the XR500 Pro hardware is relatively timid compared to, say, an Asus ROG Rapture GT-AC5300, but a big part of the Nighthawk's appeal emanates from the accompanying DumaOS software. 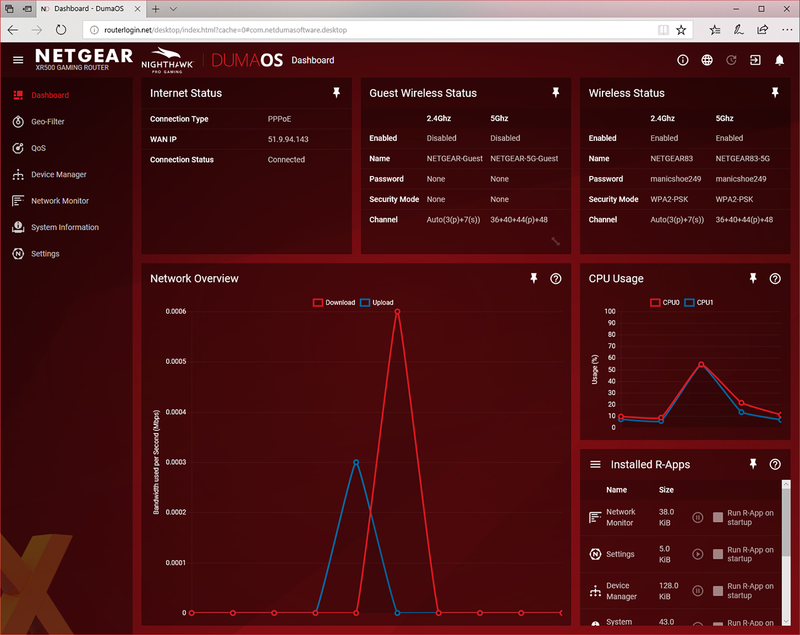 Featuring for the first time on a third-party device, Netduma's operating system, based on the OpenWRT framework, has previously been limited to the comparatively basic Netduma R1, and Netgear's potent hardware helps bring the forward-looking OS to life. Why all the fuss around DumaOS? Router software isn't typically renowned for being cutting edge, but Netduma's operating system is built from the ground up to be intuitive, interactive, and geared for gaming. Such features thankfully need not come at the expense of ease of use. Initial setup is a cinch - simply point the browser on a connected PC to routerlogin.net and follow the configuration wizard - and most users will be up and running within a matter of minutes. 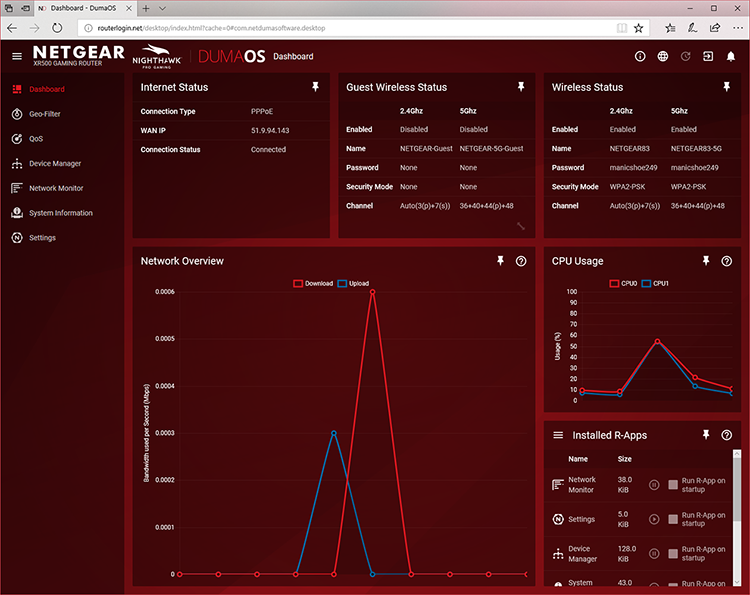 Once installation is complete, the user is dropped into the DumaOS Dashboard, pictured above, and it becomes immediately apparent that this isn't your regular router operating system. It's fast, slick and customisable, and pitched as a destination that enthusiast users will want to frequent. The Dashboard can be rearranged as you see fit, with resizable widgets pinned to provide at-a-glance status updates, and the main menu on the left is split into seven sections that are all worth visiting. DumaOS isn't single-handedly leading the charge - Linksys WRT32X does a grand job of simplifying gamer-orientated features, while Synology Router Manager offers a high level of polish - but Netduma's software is up there with the very best and has a few neat tricks that warrant a closer look.